This hanging star light fixture is designed to create elegant lighting to accent your rustic, southwest, or Santa Fe style decor. 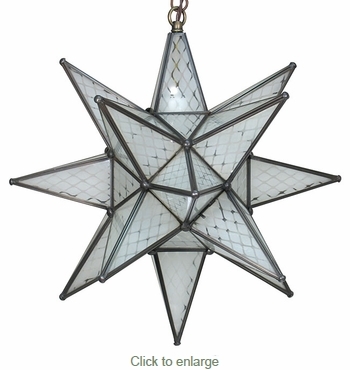 This Mexican star lantern has a frosted Mayan pattern on each glass panel and is framed with aged tin. All of our star light fixtures are authentic creations handmade by artisans in Mexico.